If you’re looking for school playground equipment in Essex, you’ve come to the right place. Setter Play is home-based county, and has been for over two decades! We have worked with local schools and nurseries in Essex to design playground equipment and outdoor furniture that suits the needs of all children. Creative play can enhance children’s education and is something that OFSTED look out for in their inspections. If you’re to make sure your school meets OFSTED requirements, why not consider our playground equipment in Essex? Here at Setter Play, we specialise in design, manufacture, and installation – creating a school playground that works best for you and your students. Our school playground equipment in Essex is manufactured to suit children of all ages and abilities – offering something suitable for everyone. Arrange a consultation to discuss your initial ideas with our team of experts. A plan is created – taking into consideration the permission required and identifying where everything will go. Once you’re happy, we will design playground equipment to meet your unique requirements. We then install playground equipment in Essex – making sure it’s installed correctly and safely. The team at Setter Play is always on hand to advise and support you after your equipment has been installed, so if you need any more information, don’t hesitate to get in touch with us. At Setter Play, we pride ourselves on delivering the highest level of service and have a wide range of products for you to choose from. 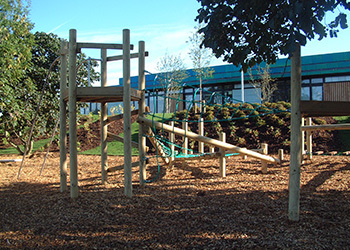 Our climbing frames in Essex encourage young students to use their imagination and to be more creative. No matter what you’re looking for, we are confident you’ll find what you’re looking for, here at Setter Play, and if you don’t, contact us today. Our climbing frames in Essex are designed to offer a challenge for all children – allowing them to push their own boundaries and to learn new skills (i.e. teamwork, communication, grip and grasp). Updating your playground equipment with our new, exciting climbing frames, slides and swings will instantly make outdoor play more appealing for children. Installing picnic benches and canopies is great for break times and lunchtimes and will allow you to take lessons outside the classroom too. We make sure all our playground equipment matches the needs of children, staff, and parents, and also blends perfectly with the surroundings. If you need to know more about our playground equipment for schools and nurseries in Essex, be sure to get in touch with us at Setter Play. Our team will be more than willing to offer their expertise to ensure you find out exactly what you need to know, so call us on 01462 817 538 today.